Combat action at the 36th annual Bladder Grabber. This match is in the preliminary event on Friday, High-Performance 1/2-A Combat, between Lee Letchworth (left) and Robert Smith. Flying Lines photo. 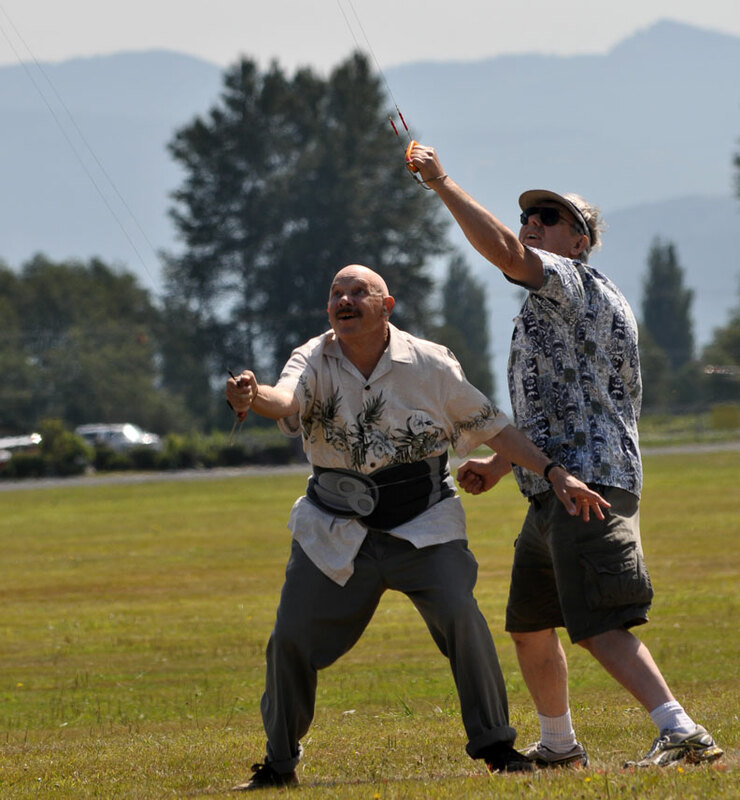 Seven-round Fast Combat tournament, Aug. 9-10, Snohomish, Wash.
Ron Colombo (right) celebrates victory in the Fast Combat championship match against Robert Smith (left). Flying Lines photo. 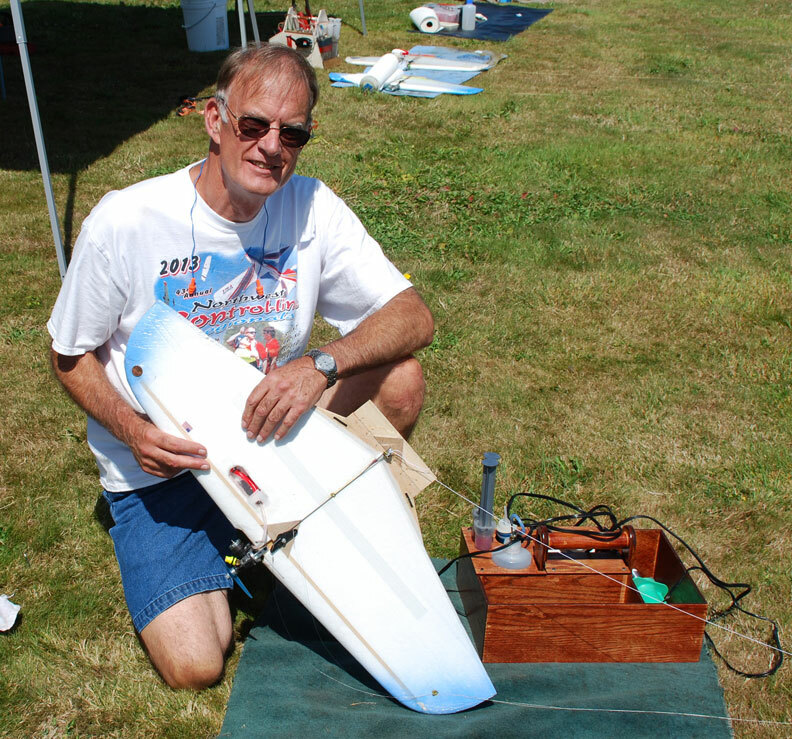 Ron Colombo of Dearborn, Mich., accomplished a feat that has not been done in recent memory -- winning the top-gun Bladder Grabber fast combat tournament in the same year as he won the U.S. Nationals in Muncie, Ind. Colombo finished the contest with a 8-1 record, taking a victory from Robert Smith of Roy, Wash., in the championship match. The championship carried with it a coveted 2014 Nelson .36 engine as a prize. Smith finished with a 6-3 record and also took home a Nelson .36 for his excellent flying efforts. Mel Lyne captured third place and another Nelson .36. 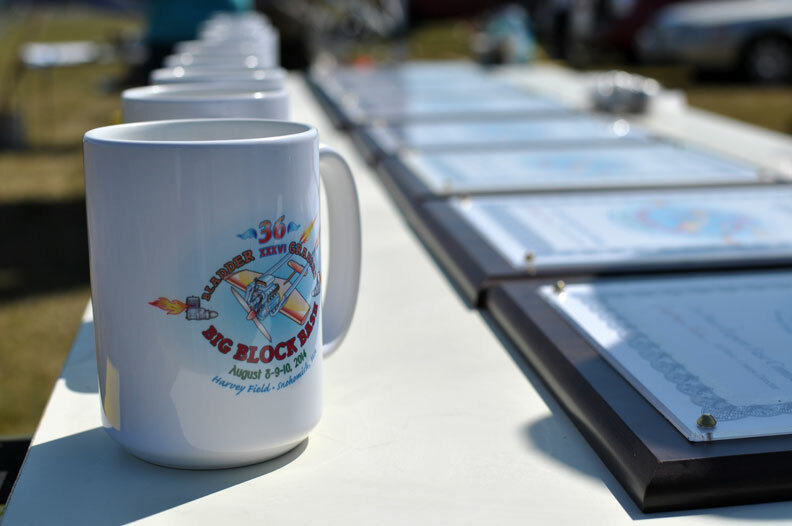 All top-four placers also received commemorative Bladder Grabber mugs and those who did not receive engines were awarded cash prizes. 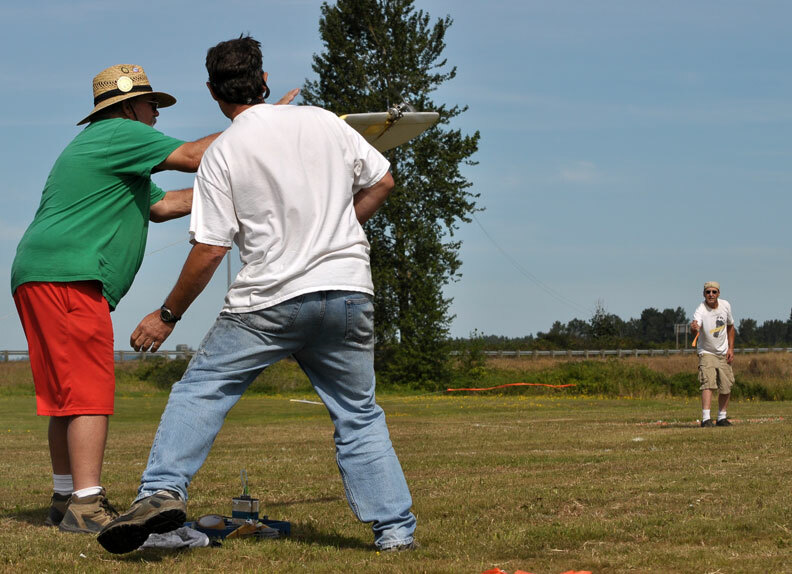 The 36th running of the most prestigious AMA Fast Combat contest drew 13 entries to Snohomish, Wash., for the traditional weekend of speed, noise, mayhem and the honor that very few Combat fliers in the world hold: Bladder Grabber winner. All contestants agreed that the 2014 contest was one of the smoothest-run, most enjoyable events in the Bladder Grabber's long history. Jeff Rein was the director and lead judge, assisted by judges Rich Ambler and Don McKay and hard work by assistants Buzz Wilson, Daniel and Nathan Johnson and several other helpers. 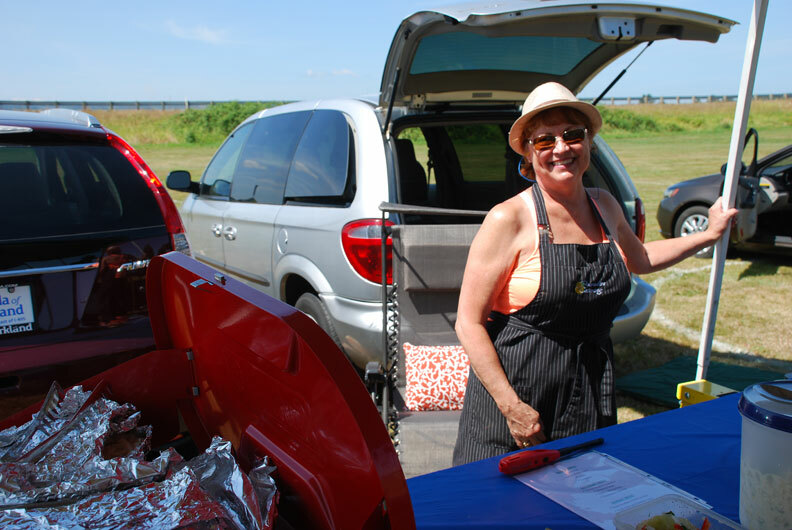 A highlight of the contest, as usual, was the sumptuous three-day feast provided by Roberta McKay -- the hot dogs, ribs, chicken, salads and deserts were enough to draw a crowd all on their own. The contest format was changed slightly this year, and once again, contestants appeared happy with the result. 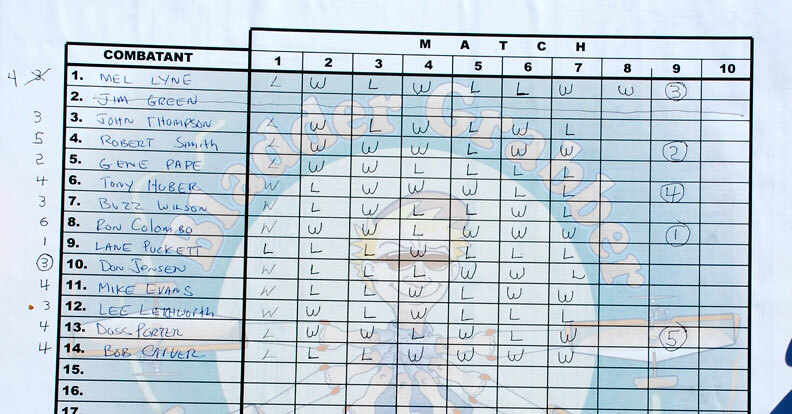 As in recent past contests, there were seven rounds involving all of the fliers. In past years, after seven rounds the records were examined and placings determined after flyoffs if necessary. In this year's contest, the seven rounds were used to determine four semifinalists. It took a couple of flyoff matches to set the semifinal, which boiled down to Colombo, Smith, Mel Lyne and Tony Huber. The other change in the format was that the recent "geezer rules" match procedure was dropped for the fast combat portion of the contest, though it was used in the 1/2-A preliminary event. For the fast combat, normal AMA rules were used, meaning that the pilot was at the handle and a two-man pit crew started and launched. The procedure carried with it the estra excitement of the instant start-launch. 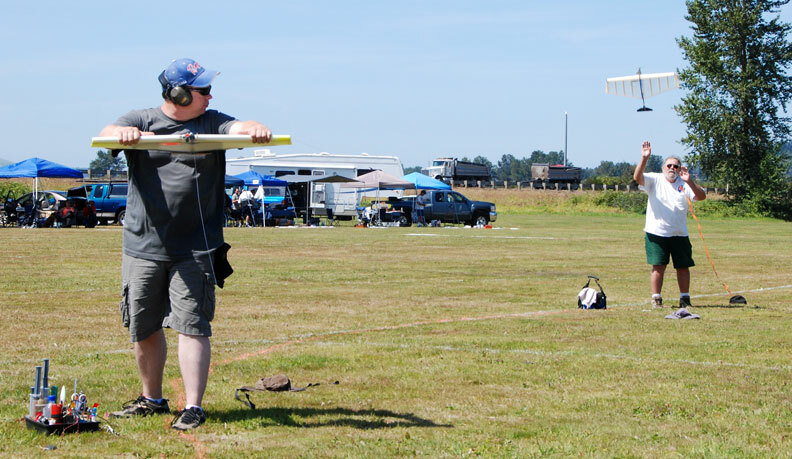 Buzz Wilson of Belfair, Wash. won the Friday preliminary event, High-Performance 1/2-A Combat, winning the fourth Nelson .36 awarded at the Grabber..
A variety of airplane designs were used in both events, with many of the 1/2-A planes and some of the fasts from builder Jeff Dawson. 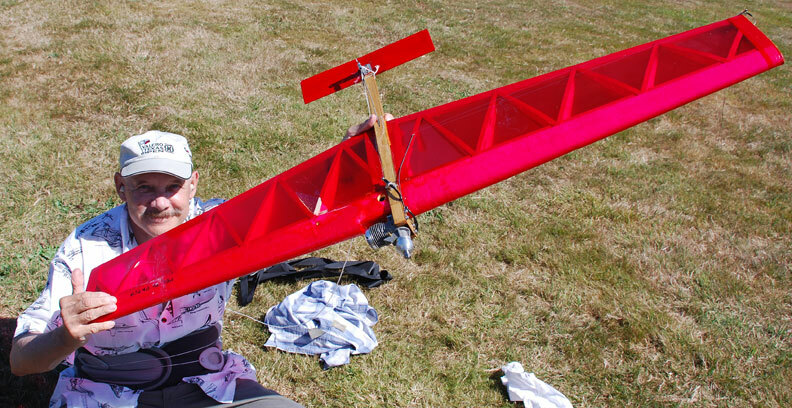 Perhaps the most attention was attracted by the dazzling red Creamsicle airplanes flown by Bob Carver. 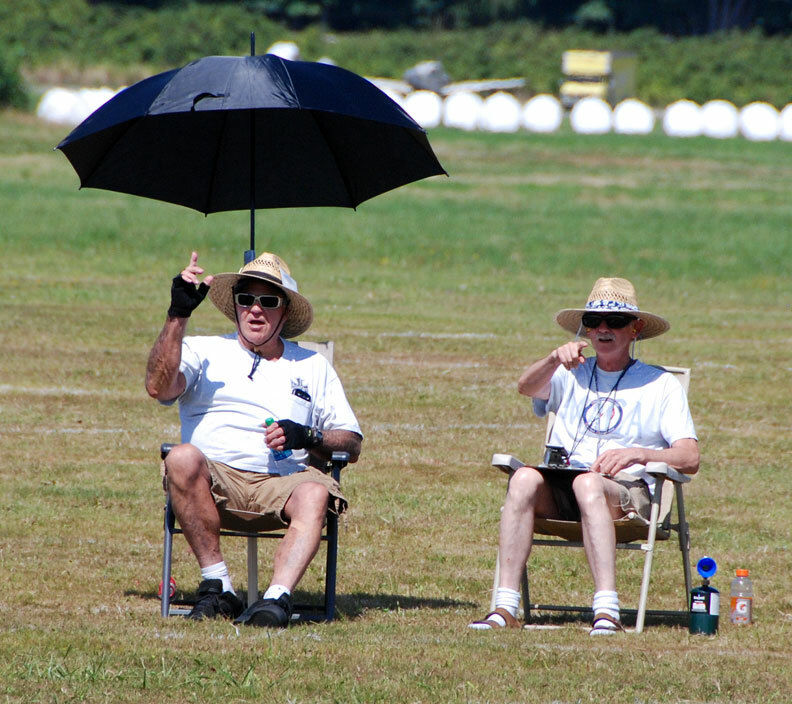 Bob, who formerly sponsored the Bladder Grabber for many years, returned to fast combat after a couple of decades away, and his flying with the Norm McFadden-designed Creamsicles appeared just as good as when we last saw him -- he finished with a 4-3 record, winning his last four matches in a row. Welcome back, Bob! Engines in fast were almost all Nelson .36, though at least one Fora was used. In 1/2-A, Cyclons were again the dominant power source. 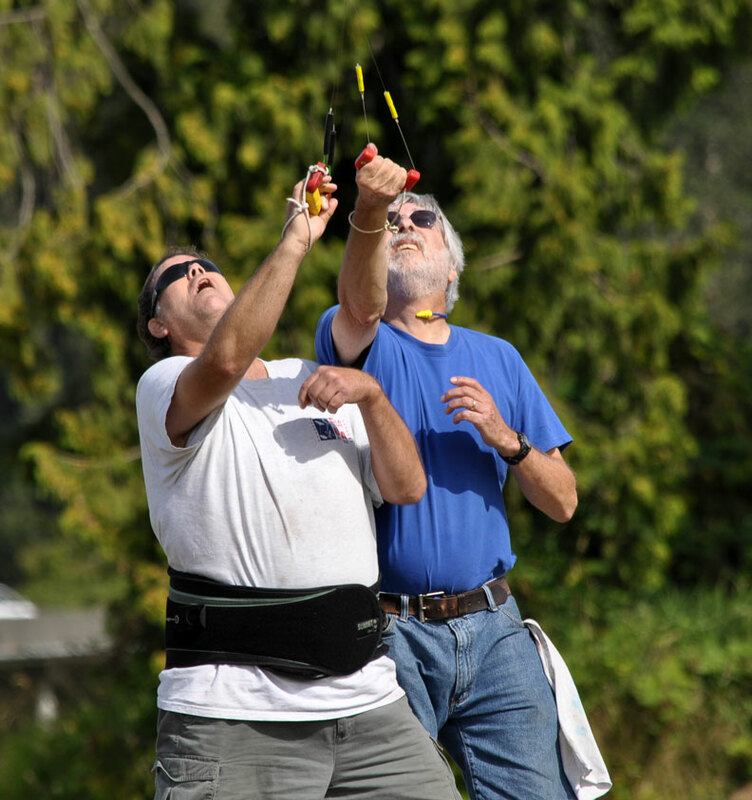 Weather was good throughout the weekend, with mostly sunny skies and very light breeze. Below is the Fast combat rounds scoreboard (flyoffs and semifinal/final matches are not listed on this board. Every year since I took over running the Bladder Brabber, I try to think of new ideas, and new ways to improve on the contest. 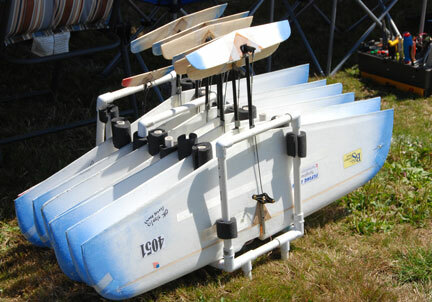 My first big major change was done eight years ago when I no longer allowed swingarm shutoffs to be used at the contest. It was very controversial at the time. The last contest that allowed swing arms at the Bladder Grabber, there were 14 flyaways. 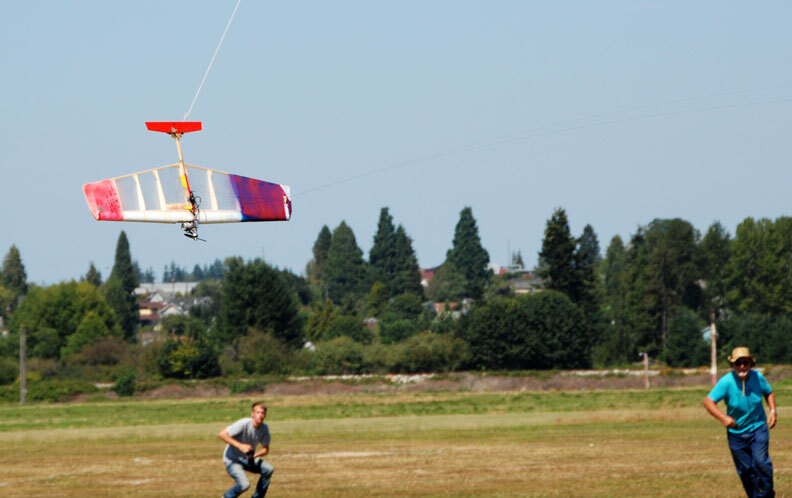 One almost landed in the middle of Highway 9, another landed in a backyard, another landed on the grass runway that the real airplanes use, and one chased away a skydiver! Something had to be done, and I did it. Since then there has not been one flyaway at the bladder grabber in the past eight years. I firmly believe that that was a good decision, and the great local rule. Then at the so-called last Grabber ever, five years ago, I decided to try catering food for everybody. I believe that was a great hit, and I continued that change to the Grabber with tremendous help from Roberta McKay. Roberta has already committed to catering food for us again next year! Another change that I implemented was to come up with the seven rounds format. I figured if people were going to travel thousands of miles only to fly three matches and go home on Saturday, that is a great disappointment. Also, the people would not show up on Sunday. With the new seven round format, everybody came back for Sunday, which made it a much better event. This year I decided to try the seven round format plus a semifinals and finals. I must give credit to Mel Lyne, who came up with the five round format with semifinals and finals in his Vintage Diesel Combat competition. I think the format that we used this year was by far the best format ever! I will continue it next year. I have done the math and we can continue with this format with up to 30 competitors. Another change that I added at the Grabber this year was a new local rule. I fondly call it "The Texas Solution". The Texas Solution states that if you have a beef with either any contestant, or judge, or judging rule, you have 30 seconds to get it out of your system. After that you will be in violation of the AMA poor sportsmanship rule, and will get a warning. If you display poor sportsmanship again, you will be out of the contest. We all know that we are all competitors, and everybody blows up at one time or another. But there comes a point to where you just have to drop it and move on. I'm glad to say that at this year's contest, not even one warning was issued for violation of "The Texas Solution." I must say that I believe that this year's Bladder Grabber was one of the finest competitions I have ever attended in my life. Even though I did not have the opportunity to fly due to health issues, not only did I have a fantastic time, but I believe everybody at the competition had three full days of great competition, good comorodery, and great food! I would like to announce now that the Bladder Grabber will certainly continue next year. There is more good news! It looks highly likely that our sponsorship for next year will be tripled, from $2000, to $6000! I will promote next year's Grabber with more vigor, to get more competitors from around the United States. I would like to get Henry Nelson back here. I would like to thank Henry Nelson for making another run of his wonderful combat motors. He told me if we can get a minimum order of 50 motors, that he would make another run. Well in two weeks of getting the word out, Henry ended up taking orders for 115! There is no excuse anymore for somebody to say while we can't get motors or we can't get props, or don't have the right airplanes. If you want to fly fast combat, come to the Grabber. Of course, as always, I will be very strict about the use of approved shutoffs, meaning "swing arms shall not apply." I plan on making next year's Bladder Grabber not only the best Bladder Grabber ever, but the best combat competition on the planet, emphasizing as Ken would say "The Fun Factor," good sportsmanship, camaraderie, great competition, excellent prizes, fabulous food and fun for all who attend. Both planes are instantly in the air for the Fast Combat championship final. 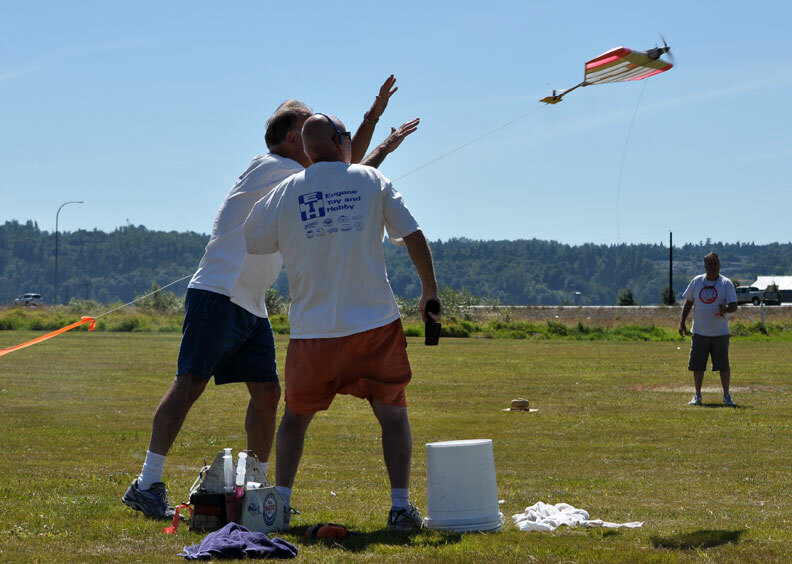 At left, Mike Evans steps aside after starting, and Lee Letchworth launches Ron Colombo's airplane. At right, Robert Smith's plane leaves Jim Green's hands as starter Gene Pape steps away. Flying Lines photo. 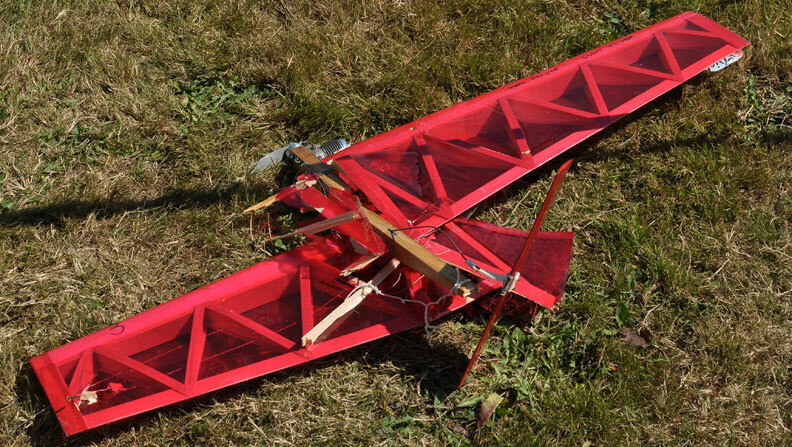 A shutoff malfunction brought Robert Smith's plane down just after launch in the final. Flying Lines photo. 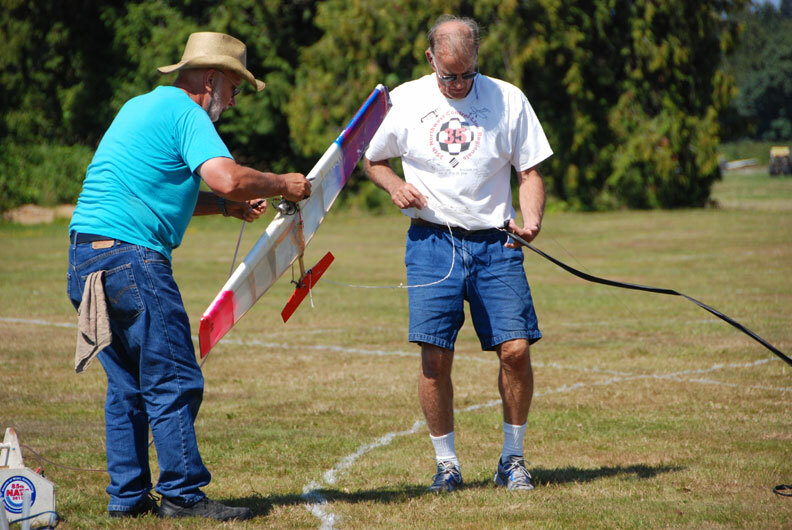 Gene Pape (left) and Jim Green work to get Robert Smith's plane back up in the final. Flying Lines photo. Buzz Wilson (left) and Mel Lyne fight it out in the 1/2-A Combat final. Flying Lines photo. 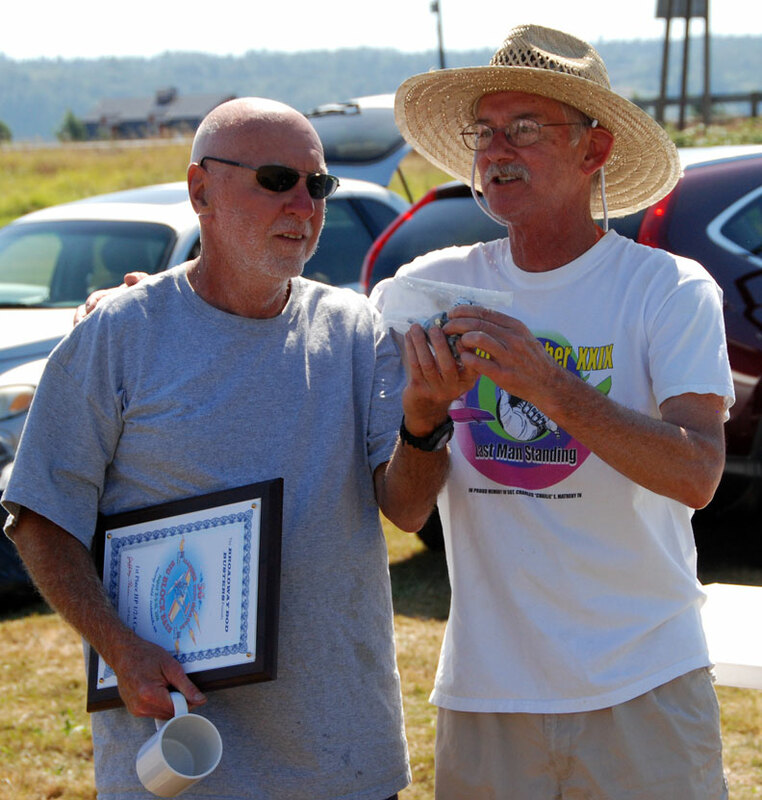 Buzz Wilson (left) receives the Nelson .36 prize from Contest Director Jeff Rein for winning the 1/2-A Grabber. Flying Lines photo. 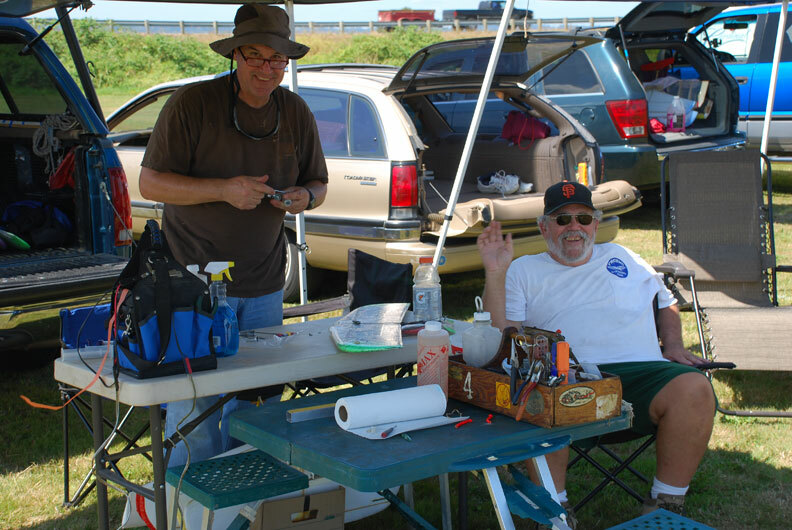 Rich Ambler (left) and Jeff Rein judged all three days of the contest. Flying Lines photo. Lane Puckett (left) and Doss Porter take a break between rounds. Gene Pape photo. 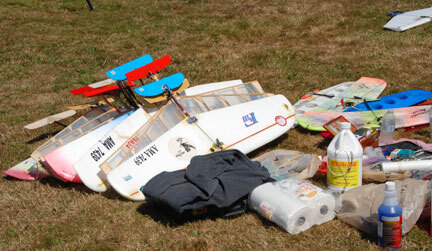 Bob Carver returned to combat action using Creamsicle airplanes, a Norm McFadden design from the 1980s that's still a top competitor. Gene Pape photo. Unfortunately, they break just like any other combat plane. Daniel Johnson photo. 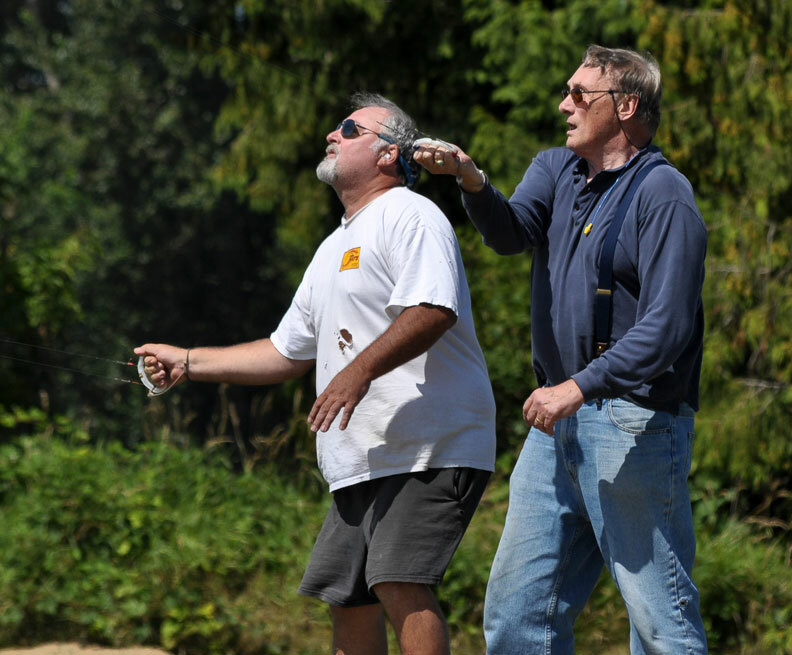 Don Jensen (left) and John Thompson battle in Saturday preliminary rounds. Daniel Johnson photo. 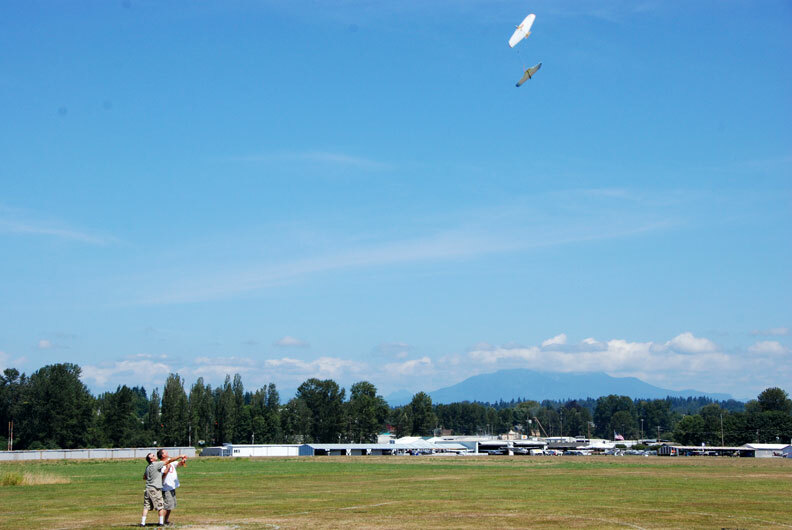 Panoramic view of a Fast Combat launch: Tony Huber releases Gene Pape's plane after starter John Thompson steps away. Daniel Johnson photo. Bob Carver (left) and Mel Lyne jockey for the kill. Daniel Johnson photo. 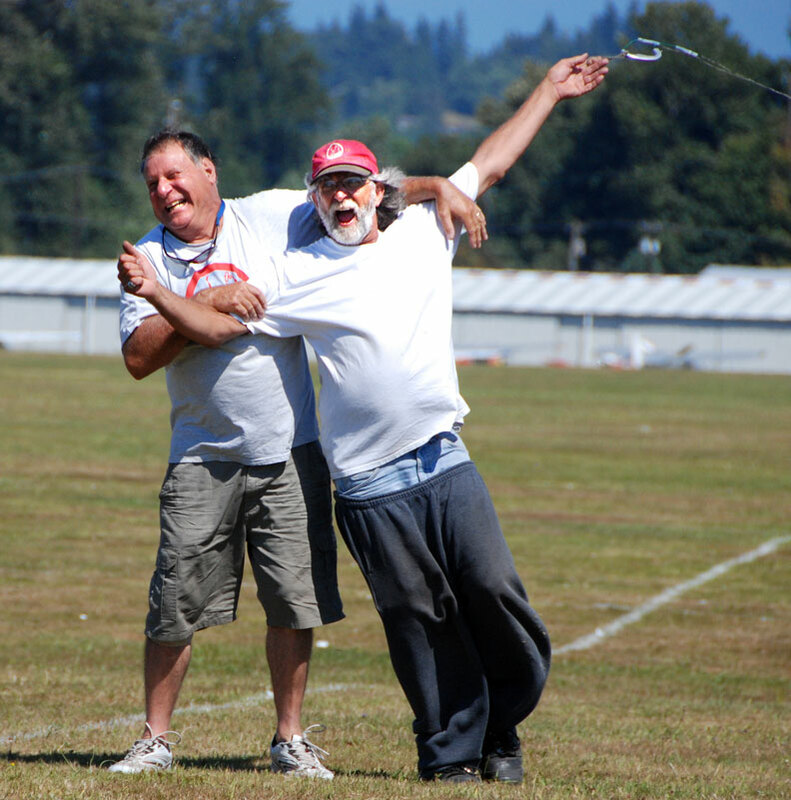 Jim Green launches Robert Smith's plane as starter Buzz Wilson stands aside. Daniel Johnson photo. Doss Porter launches Lee Letchworth's plane as starter Lane Puckett steps away. Daniel Johnson photo. Duke Johnson prepares to launch Mel Lyne's 1/2-A Combat plane; Doss Porter already has released Lane Puckett's plane. Flying Lines photo. 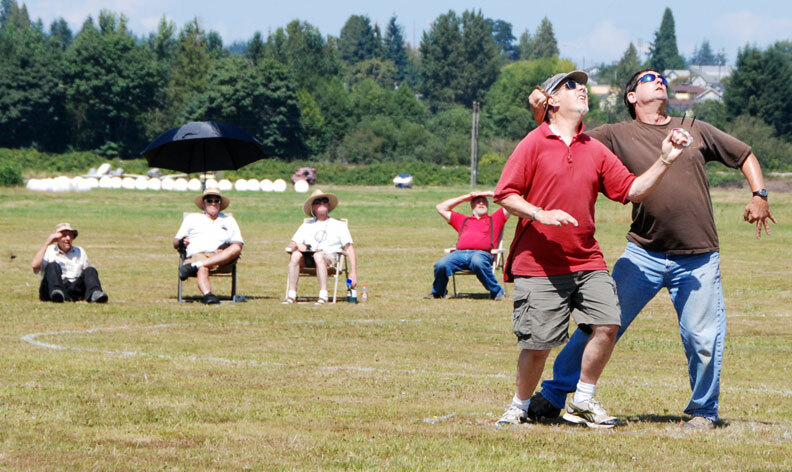 Mel Lyne (left) and Lane Puckett fly their 1/2-A match, with the judges in the background. Flying Lines photo. Mike Evans launches Ron Colombo's 1/2-A Combat plane. Daniel Johnson photo. 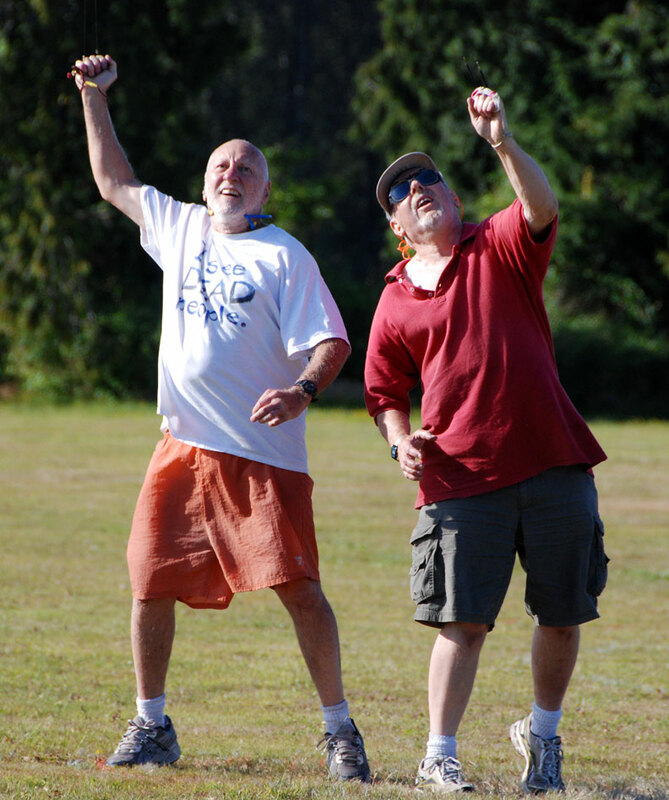 Mike Evans (left) and Don McKay battle in 1/2-A Combat. Daniel Johnson photo. Jim Green flew only 1/2-A this year but was busy as a pit crew member all weekend. Gene Pape photo. Fabulous food from chef Roberta McKay kept all the fliers happy whether they won or lost. Gene Pape photo. 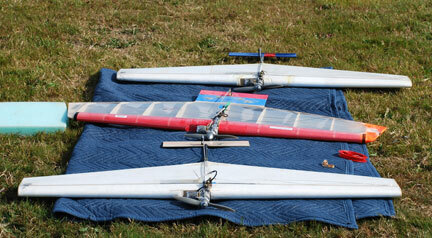 A montage of some of the various planes scattered about the field. Flying Lines and Gene Pape photos. The prize table, with the most coveted mug in all of control-line Combat. Daniel Johnson photo.